Discover San Diego’s Neighborhoods with our Summer Sweepstakes. Join us every week as we showcase the best in what to do, where to eat, and where to stay in some of San Diego’s unique neighborhoods. Be sure to check back for exciting insider tips, giveaways, and more! This week’s spotlight is on beautiful La Jolla. 1. 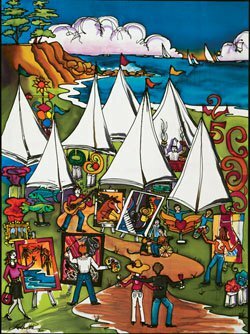 25th Annual La Jolla Festival of the Arts – The La Jolla Festival of the Arts, one of the top-rated art shows in the state, is taking place June 18 and 19 on the USCD east campus. Showcasing nearly 200 award-winning local and national artists, live music, classic cars, celebrity chef food demonstrations, and a live street chalking exhibition, this event is not to be missed. 2. 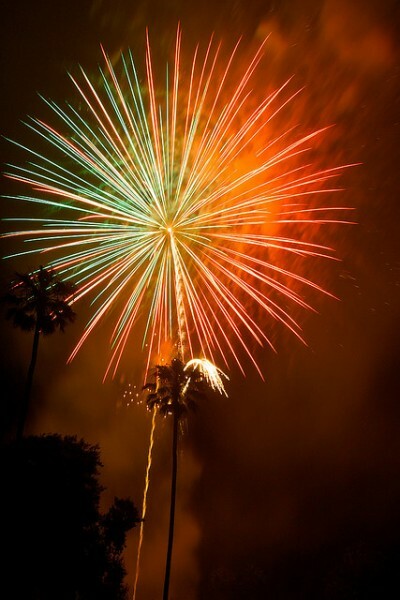 July 4th in La Jolla – The La Jolla Community Fireworks Foundation’s Fourth of July festivities kick off around 5:00 pm with a summer concert at Ellen Browning Scripps Park. Then at 9:00 pm, the fireworks blast off from La Jolla Cove. The best spots for watching the display are: Ellen Browning Scripps Park, La Jolla Shores, and Kellogg Park. 3. SummerFest 2011 – The La Jolla Music Society’s SummerFest kicks off on August 3 with SummerFest Under the Stars, a free concert at La Jolla Cove. Running through August 26, SummerFest will feature more than 70 world-class performances. 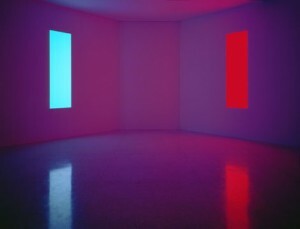 James Turrell, Stuck Red and Stuck Blue, 1970, construction materials and fluorescent lights. Copyright James Turrell. Photo by Philipp Scholz Rittermann. Collection Museum of Contemporary Art San Diego, Museum Purchase, Elizabeth W. Russell Foundation Funds. 4. Phenomenal: California Light, Space, Surface – On September 25, the Museum of Contemporary Art San Diego will open its most ambitious exhibition to date. Phenomenal will be on view at both the La Jolla and downtown San Diego locations through January 22, 2012. 5. Boundless Energy – Birch Aquarium at Scripps’ newest exhibit, Boundless Energy, opens July 9. An outdoor, interactive exhibit exploring how we can use natural forces to power our lives, Boundless Energy features highly educational, interactive elements that encourage learning through play. We want to send you to Birch Aquarium this summer. Comment below by Thursday, June 16th at 10:00 am and get entered to win a family four-pack of tickets to Birch Aquarium at Scripps. This entry was posted in Arts & Culture, Outdoor Adventures, San Diego Events and tagged 5 to try, art, family, festival, free fun, kids, la jolla, live music, museum, outdoors, summer, things to do, what to do by Courtney. Bookmark the permalink. Congratulations Claudia Gomez! You won the four tickets to Birch Aquarium at Scripps. It must have been hard for Courtney to pick only five summer events in La Jolla because there are soooo many more. I love the Green Flash Concert Series at Birch Aquarium and the free concerts in Scripps Park near The Cove every Sunday afternoon. And what about Flicks on the Bricks? Can’t forget that film series at the Athenaeum. I have a whole calendar of La Jolla events on my website. I will be visiting San Diego in July and would love to take my family to the Birch Aquarium to experience some Boundless Energy. The art galleries in La Jolla and La Jolla Cove are two places I never miss on a trip to San Diego. I LOVE La Jolla! It’s one of our favorite places in San Diego. I don’t think there was an Aquarium when I lived in San Diego. My family had summer family reunions on the beach. I’d love to see my family again. And there are no beaches anywhere else like the ones down there! I’ve been to SD several times but never visited the the Scripps Aquarium…now I have an excuse to return. La Jolla is so beautiful! i’ve been gone from the san diego area for 5 years, and not a day goes by that i miss it. i’d love to see the new Birch exhibit! A frosty ice cream cone. A gazillion fun things to do. I love the Aquarium! And the fireworks in La Jolla are awesome. I remember going the the aquarium back when I was in 4th grade (I’m 33 now) and have never forgotten that day. I was amazed at all I learned about the ocean and I remember being grossed out at the sea cucumber they brought out. I would love to take my family to see and learn just like me about the wonderful things that are living in our beautiful beaches so close to home :-)! Haven’t been to the Aquarium in years. My kids have gone more recently than I and they loved it! Would love to go as a family!! I haven’t been to San Diego for almost 50 years but I still have memories of the best times in my whole life there. I spent every weekend in Balboa Park the last few years going to the zoo, museums and taking ballet lessons. I bet everything has changed since then. All these are great ideas! We are looking forward to our “staycation” in La Jolla! Thanks for all of these tips I will have to check some of them out! Thank you for the opportunity to see the Birch Aquarium, what a great day that would make! The Birch Aquarium is one of my favorite places in SD. Who doesn’t love seahorses? I’m glad I found this blog! I’m excited to follow it. My family and I will going to SD next month we can not wait! I really need to visit sd! SD is a great get away from the heat in Tucson AZ! We love taking our family to the Birch Aquarium! After living here 2 years now we are finally going to Kayak La Jolla Shores and Caves this summer. Will have to check out Boundless Energy! La Jolla is the most Romantic Beach in California,,,, love to spend time there with my honey. Haven’t been to Scripps in a long time have two grandaughter that I would love to take…. I love La Jolla. I was at the cove recently and there were sea lions nursing their babies. Adorable! My son would get a kick out of going here, let’s see if ya’ll can make this happen. If not guess Daddy will! I haven’t been but would like to go. San Diego is the place to be. Born and raised. I couldn’t live anywhere else! La Jolla is so beautiful. it’s a nice change of scenery, especially when u live south of the 8 🙂 the kids and I would have a great time! I visit San Diego every year for the past 8 years and have never been to the Birch Aquarium. I hope I get to go! It would be a treat to go! Cant wait to be in san diego next week, hope I win…. I’ve never been to the Birch Aquarium. I hope I win, I hope I win (clicking my shoes) LOL! Thanks for the opportunity. I’ve never been to the Birch Aquarium. I hope I win, I hope I win (tapping my shoes). Did it work! LOL! Really excited to visit San Diego all the way from West Virginia this July. Can’t wait to visit the beautiful La Jolla beaches while I’m there! Thank you kindly for the information. Nothing like summer in San Diego / La Jolla! Everything is perfect! Birch Aquarium is on my list of things to do when I am in La Jolla this July! I been wanting to take my family here for quite some time now. Hope everyone has a great Summer. We would love to combine this with a College camput road trip for our future marine biolist in the family! Would love to win the Birch Aquarium tickets! We have never been, but hear it’s really nice! Ooo! I love summer in La Jolla! The Scripps Aquarium is a special place and I hope (finger’s crossed!) that our family will get to go! Love the Birch Aquarium…haven’t been there for a few years.